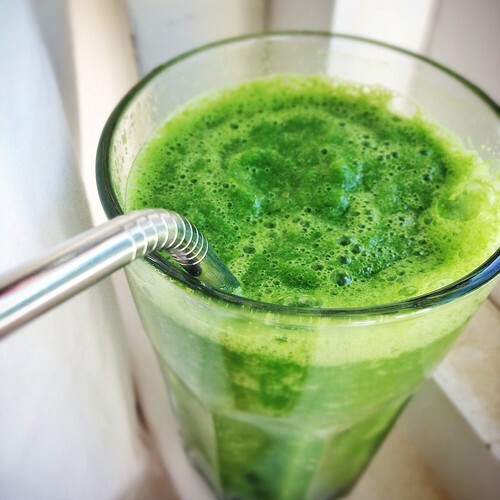 My friend Shweta sent me a link to a few smoothie recipes that recently appeared in an Emerald Street newsletter (some kind of style and fashion newsletter, no wonder I missed it). One smoothie in particular caught my eye: an “Enzyme-Rich” juice full of green stuff: cucumber, celery, parsley, mint and spinach. So I gave it a try yesterday, adding a pear because my mind hasn’t yet quite grasped the idea of a smoothie without fruit in it. The result was kind of amazing. I can’t say I’d have this smoothie every morning, but it does have its place in the lexicon of liquid breakfasts. It was particularly good after a hard workout – the cold, almost savoury juice, tart from the addition of lemon, is super refreshing. Not to mention hydrating… this recipe almost filled the jug of the Vitamix and I drank the whole thing. Put everything in a blender with enough water to get it going. Strain through a sieve if you’d like (I didn’t bother).